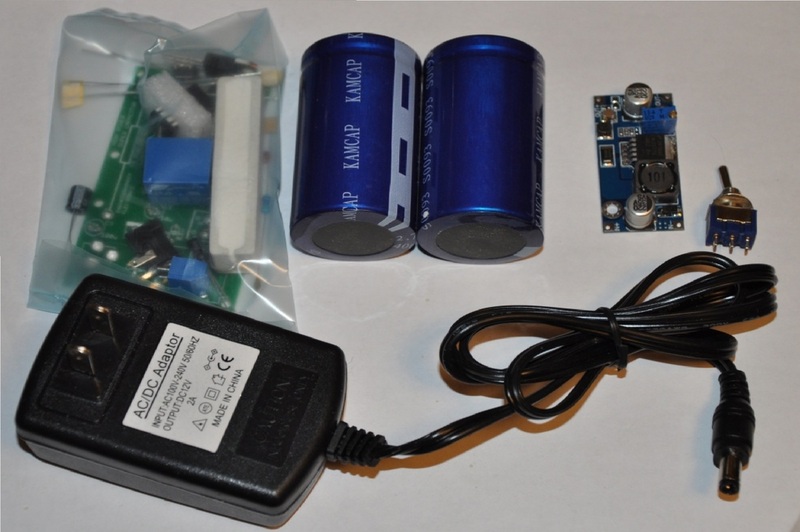 This listing is for a high power super capacitor charger DIY electronics kit that has four selectable charge modes, which are talked about below. This is the best variant of this kit that we offer! It is very easy to use once assembled. The above video shows you how it works, and offers step by step assembly instructions, so be sure to watch! We are selling many variants of this kit. This set comes with the DIY charger kit, 2x 400f 2.7v super capacitors, a 3.4-34VDC variable voltage booster, a SPDT rockers witch, and a 12v 2A wall adapter. Check out our other variants in our store! This charger kit is a substantial upgrade from our last charger that charged at a mere 500mA. When assembled, this charger charges at a whopping 1.5A / 18W! It charges super capacitors very fast. It can charge single capacitors, or banks of two in series. You can also put capacitors in parallel to double the capacitance. Once it is done charging, the relay shuts off, the charge circuitry and the super capacitor, or series bank become completely isolated from one another, so that there is no back-powering when the device is off. Make sure to watch the video above which offers a FULL demonstration & assembly instructions, and read the information below. There are test points right beside the super capacitor charge terminal block so that you can use a multimeter to watch the charge if you are interested. You can also splice off of these lines and leave the capacitors connected to the terminal block. There are 8x mounting holes on the edges of the board that you can take advantage of. We also sell these in fully assembled and tested form for a few dollars more, so make sure to have a look through our inventory! 1) 2.5v - This mode charges your capacitor to roughly 2.42v to 2.45v. This is to ensure that you capacitor is charged to a safe level. This mode is meant for super capacitors that have a maximum voltage rating of 2.5v. Please watch the above video to see how the 2.5v charge is selected. You have to press the button until the LED blinks once. As soon as the on board LED blinks once, let go, and the relay will click on,.which means that charging has commenced to charge to just under 2.42-2.45v. The charge voltage is designed to be just under the maximum charge value of the capacitor to ensure that no damage is done to your capacitor, and do ensure that your caps have a long life! 2) 2.7v - This mode charges your capacitor to roughly 2.60v to 2.65v. This is to ensure that you capacitor is charged to a safe level. This mode is meant for super capacitors that have a maximum voltage rating of 2.7v. You have to press the button until the LED blinks twice. As soon as the on board LED blinks twice, let go, and the relay will click on,.which means that charging has commenced to charge to just under 2.60-2.65v. The charge voltage is designed to be just under the maximum charge value of the capacitor to ensure that no damage is done to your capacitor, and do ensure that your caps have a long life! 3) 5v - This mode charges a series bank of two 2.5v capacitors to a voltage of just under 5v. This is to ensure that your series capacitor bank is charged to a safe level. This mode is meant for two series super capacitors that each have a maximum voltage rating of 2.5v. You have to press the button until the LED blinks three times. As soon as the on board LED blinks three times, let go, and the relay will click on,.which means that charging has commenced to charge to just under 5v. The charge voltage is designed ONLY for series capacitor banks of 2x 2.5v capacitors. Do not charge one single super capacitor to 5v, as you will damage it! If you have questions, please do not hesitate to ask! 4) 5.4v - This mode charges a series bank of two 2.7v capacitors to a voltage of just under 5.35v. This is to ensure that your series capacitor bank is charged to a safe level. This mode is meant for two series super capacitors that each have a maximum voltage rating of 2.7v. You have to press the button until the LED blinks four times. As soon as the on board LED blinks four times, let go, and the relay will click on,.which means that charging has commenced to charge to just under 5.4v. The charge voltage is designed ONLY for series capacitor banks of 2x 2.7v capacitors. Do not charge one single super capacitor to 5.4v, as you will damage it! Youc an only use this setting if you have 2x 2.7v super capacitors in series. If you have questions, please do not hesitate to ask! This is an extra add-on that I thought would be fun. The two test points talked about in the video can be soldered to. These test points (CAP+ and GND) can be used as power outputs. If you solder the SPDT switch between the IN+ solderable lead on the voltage booster, and the CAP+ test point on the charger board, and you connect the GND test point on the charger board to the IN- (Ground) solderable lead on the voltage booster, when the SPDT is switched on, power from the capacitors on the charger board will be applied to the voltage booster. The output of the voltage booster can boost the capacitor voltage up to a maximum of 34VDC. The booster has a 10-turn variable resistor on board that allows for you to fine tune the output anywhere between the input voltage (Minimum 3.4v and 34VDC). Meaning that if you have anywhere from 3.4v to 5.4v on the capacitor bank, you can boost up to 12v, 24v, 27.5v, 24v, etc! Simply turn the variable resistor to tune the output before loading anything on the output pins. This is the only calibration requirement. The output pin OUT+ is your positive DC output pin. OUT- is your output ground pin. Connect this to the ground on the circuit you are powering. The booster has two mounting holes on it. If you have any questions at all, please do not hesitate to ask. The booster will stop boosting when the power on the capacitors drop below 3.4VDC. If the differential between the input and output of the booster is 5v or less, you should be able to source up to 1.5A. The higher the differential, the less power can be sourced through the booster module. If the differential between the input voltage and output voltage is only 2-3v, you should be able to source up to 2A MAX. This booster has solderable leads. 1) The charger requires 11.5v - 13v @ 2A minimum to operate. Minimum current consumption is 1.65mA when charging. Nominal supply voltage is supplied by the 12v @ 2A wall adapter. 2) The voltage booster requires a minimum of 3.4v to boost to higher voltages. - No Voltage booster comes with this variant of the kit. We have other variants that do, but this kit does not. What you see in the picture is what you get. The one board 8 ohm 20 watt current limiting resistors gets VERY HOT when charging. As well, the 5v on board regulator can become relatively hot as well. Make sure to be VERY CAREFUL not to burn yourself while the device is charging super capacitors. Once the charge has completed, it takes about 15 minutes for the resistor and the regulator to cool off. Please be warned, as I will not be held responsible for any burns or issues you may have at your end.